I like my Pizzas with thin crusts. Every time we order Pizza in a restaurant, we are often greeted with a basic thick crust pizza. And that gives me a feeling that I am biting into more of breads than the toppings. I am also fond of nice thick layer of vegetable toppings. So this time I went ahead to make my thin crust pizza dough at home. It's simple to make, but requires planning ahead in time. Making the dough requires some standing time for the yeast to culture, so just plan your meal ahead so that you can prepare the dough. Once the dough is rolled out, all it requires is spreading the sauce, the toppings and loads of cheeeeese! It's pizza customized to your taste buds. So what can be better than that! I shall share the pizza dough recipe this time and the toppings probably the next time. In a small bowl, mix the dry yeast in warm water, add a tsp. of sugar and stir to dissolve it. Set aside for about 5 minutes so that the yeast dissolves well and becomes frothy. Heap the flour into a large bowl and make a hole in the center. Pour the yeast mixture, salt to taste and 1 tbsp. of olive oil. Stir all the ingredients to form a soft dough. Add very little water if its stiff to bind, add just enough flour to hold together if its too wet. Knead the dough well and cover with a kitchen towel. Set aside in a warm place for an hour to rise. After an hour or two, the dough would have doubled in size. Now punch the dough down and divide into 2 balls. Roll into thin crust or thick crust as per your preference. 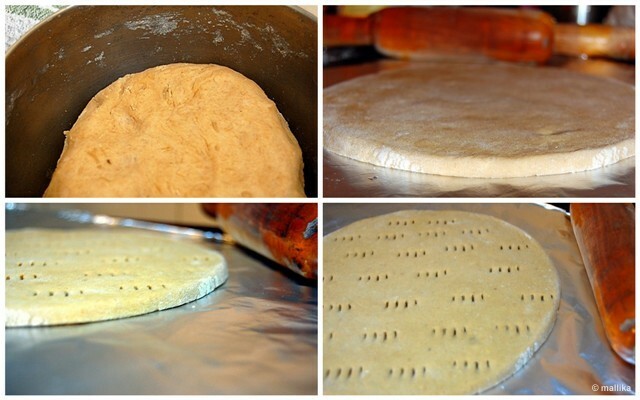 Poke a few holes into the dough using fork to prevent the dough from rising from the center. Pizza base is ready for use! Updated: If using a microwave with convection mode, its best to pre-bake the pizza on either sides for a couple of minutes. This will ensure the dough is not raw or half baked while the cheese has melted and turned golden brown. And just in case you do not have pizza sauce handy, or you ran out of stock and you do not have sufficient time at hand to slog in front of your stove, then make this super easy and quick version. I have an express recipe for a homemade pizza sauce. This was picked from one of the Italian cookbooks, the name of which I can't recall at the moment. Fry a tablespoon of finely chopped garlic with olive oil till translucent. Add a cup of ready-made tomato sauce to it. Sauté for a min or two. Add a dash of Italian herbs or seasoning and the pizza sauce is ready! This sauce is good pastas and lasagnas too. Lay the pizza base. Spread the sauce. Dress it with toppings of your choice. Top with cheese. Pop into the oven and bake till cheese browns. And your Pizza is all ready to be served! Wash and chop all the vegetables to medium to small bite sized pieces. Lay the homemade pizza base on a baking tray or pizza stone, spread some pizza sauce, sprinkle a tbsp of cheddar or Parmesan cheese. Then arrange the vegetables on the base. Add salt, pepper and chili flakes to taste, as preferred. I don't usually add any salt as the cheese has enough salt in it. Finally top the pizza with loads of mozzarella cheese. Bake in a pre-heated oven on 180 deg C.
Serve hot with Italian herbs, oregano and more chili flakes for that extra spice. Enjoy! And if you like Deep pan or Thick crust pizza, then this bite is for you! Enjoy!!! For the past few days, i experimenting on pizza dough, today i found urs. i wanted to try the pizza dough with Sour Yogurt. Can you update, when the sour yogurt to be added, if i want to use yogurt instead of milk. Thanks Lavi, I am glad you likes my site. Regarding your query, I suggest you reduce the amount of warm milk sufficient only to dissolve the yeast, may be a teaspoon or two. Once the yeast is frothy, use sour curd to bind the flour to form a dough. I hope this helps you. Warm milk or water doesn't make much of a difference. Go ahead and use water if you are not convinced, though warm milk works equally fine too. 1) If the base you make is thick crust, it's best to pre-bake it partially and then dress it with topping and bake till done. Generally the cheese on the pizza melts in minutes and if the base is undone, it will taste raw. 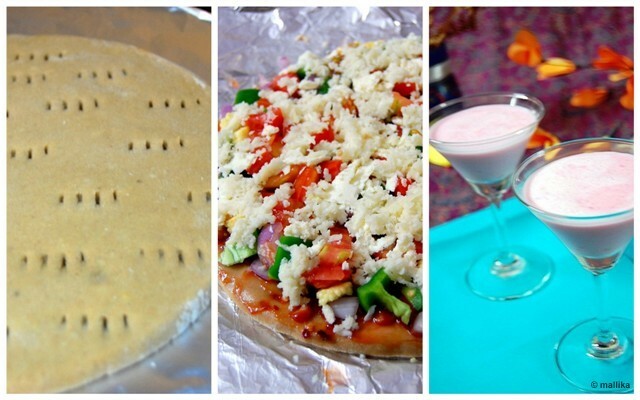 However, if you plan to make a thin crust, then you can roll out the base thinly, similar to our Indian rotis and then throw the toppings on them and bake directly. 2) In a microwave, use the convection mode that comes with it. Convection mode turns the oven to a baking unit doing the same job that a conventional oven does. The time to bake would depend on the quantity and size of the dish to be baked and the oven itself. However, generally an overall baking time of 30-35 mins should be good.